Have you ever wondered who the top commenters on BYU discussion boards, are and if they vary from one publication to the next? 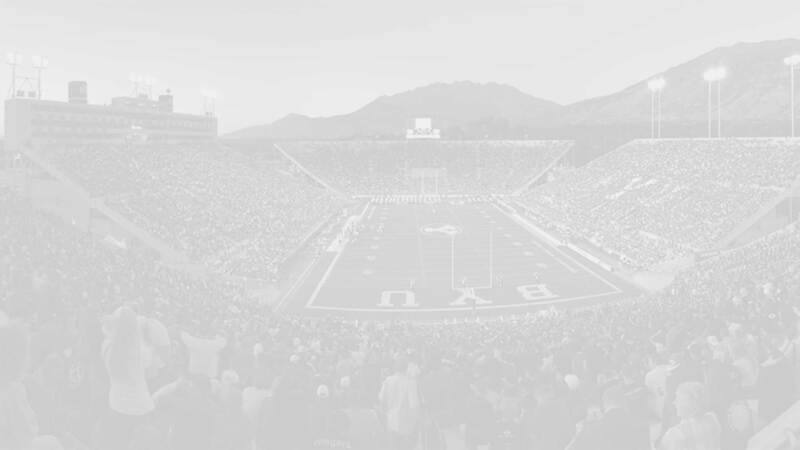 Would you like to know how often articles are written about BYU football and which articles get the most traction? How about how you stack up against other posters on the discussion boards? Yeah, well me too… so I decided to do some digging. Newspapers generate revenue through print subscriptions and home delivery, news stands, print advertisements, classified ads, and through digital advertising. While most newspaper money is made selling advertising space to local and national advertisers the lion’s share of revenue is coming from print advertising with digital ads making very little. So to compensate for that newspapers often make their online versions somewhat gimmicky so readers will click on ads or be exposed to more ads (annoyed by the 30 click through posts on DNews?… yeah, me too). Even with these tricks online publications typically make very little money. User comments show that readers are engaged (spending time on the website) so it stands to reason that publishers would want to encourage commenting on each article and the articles with the most comments are likely driving the most traffic to the site and generating the most revenue for the publisher. So which articles get the most comments? Who is doing the commenting? One of the benefits of going through a month of data is that it is a nice way of reflecting on the state of the program. So what do we learn about the state of BYU football? It is telling that four of the top five articles for the month are related to the future of BYU football, not the current state of the program. Readers have obviously moved on from the disappointment of this season and are eagerly anticipating what lays in store for BYU football. We want Hill back, we want to schedule quality programs (especially in LES), and we want to fast forward to high quality match-ups (like Cal, the bowl game, and next season). Who is commenting about BYU football? Without doing the analysis I guessed that the top poster would be Chris B (with all his aliases) and the top ten would be split with half being anti-BYU trolls and the other half die-hard BYU fans. I was wrong on both accounts. I tallied up how many comments each user made and the findings might surprise you. Previously prolific (or at least regular) posters like Ernest T. Bass, Brave Sir Robin, Aggie238, Howard S., MiP, Duckhunter, CougFanInTX, and poyman all had less than five posts each during the month of November. 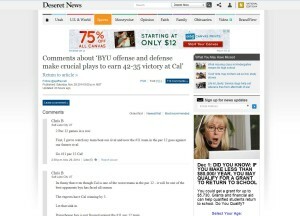 All five of the top five posters on BYU football articles are alleged University of Utah “fans” (anti-BYU trolls). I must reluctantly but sincerely thank 2fer, Chris B. Uteology, gdog3, VegasUte, and the rest of the anti-BYU trolls for helping ensure BYU remains the most read about, most discussed, and absolutely the most relevant football program in the state of Utah. There have been long-standing rumors that Chris B actually works for the Deseret News as he always seems to be the first to post. Whether that is true or not he certainly initiates a LOT of discussion about BYU and for that I am grateful. I am glad he and his compatriots have not “moved on” but continue to show support for our beloved Cougars. I don’t know if anyone cares about these kinds of statistics. If this was useful and/or you want more info let me know in the comment section below. I only looked at one month of one newspaper but if there was enough reader demand I could do a comparison of total articles and comments for October, September, August and look at any trends; compare BYU football to Utah football (by number of articles and comments); compare BYU football versus all other BYU sports; etc. I could do the same for other Utah papers and possibly even look at a few national publications. Because it takes so much time to tally up all the individual user comments I don’t plan on any other future analysis of comments unless I get several requests for such articles. Similarly, while these kinds of stats interest me I don’t know if anyone else cares… so again if you’d like me to do any particular kind research make sure to get your requests in in the comment section below or by emailing me.